September Early Sign-Up Donation Bonus & $5 Saving! When You Register For The 12 Bars of Charity During The Month of September, You Can Save An Extra $5 On Your Ticket With Promo Code LW2016 While An Additional $5 Is Donated To Hope For Young Adults With Cancer Equaling A $15 Donation For Every Registered Attendee This Month! The 12 Bars of St. Louis is the city’s largest pub crawl attracting over 9,000 attendees and raising more than $75,000 for local charity in only three years! Close to 6,000 people are expected to participate in 2016 alone. 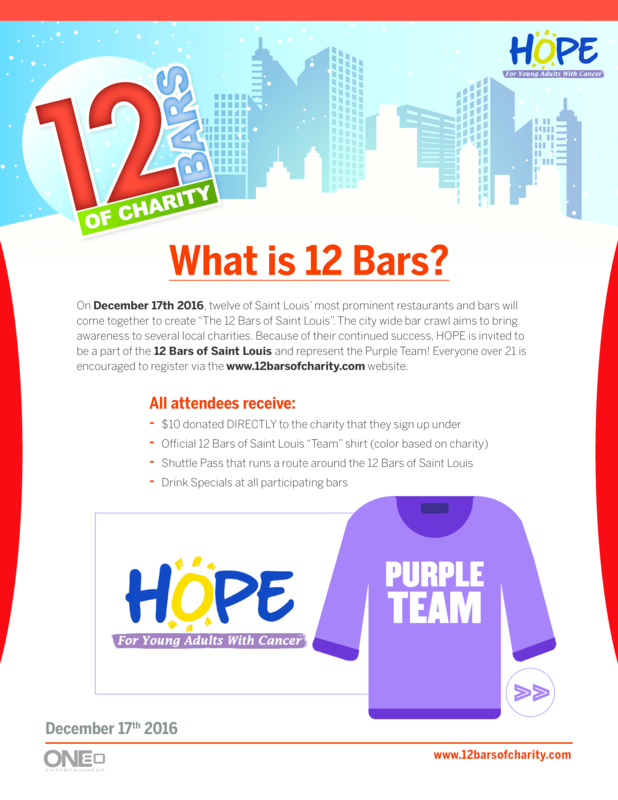 For more info visit http://www.12barsofcharity.com/home.html. – 8:00 P.M – Midnight 1/2 Priced Drink Specials At All 20 Participating Bars In Soulard, Ballpark Village St. Louis & Washington Ave.
– Start Your Pub Crawl! There Is No Start Or End Point For The Pub Crawl; Once You Check-In At The Hope For Young Adults With Cancer Registration Table, You Are Good To Go! – Shuttles Run A Continuous Loop – You Must Have Your Wristband To Ride & Receive Drink Specials. Who Is Hope For Young Adults With Cancer? Hope For Young Adults With Cancer is a 501(c)(3) organization headquartered in St. Louis, MO that is passionate about making the lives of young adults, ages 18 – 40, living with cancer a little bit easier. Our mission is to connect with our peers in the fight to provide direct financial support along with a social network and outlet for those battling, surviving and living with cancer. Hope4YAWC is one of only a handful of non-profit organizations nationwide that focuses on providing direct financial support to young adults with cancer 18 – 40. We are also the cocreators of the Adolescent and Young Adult Cancer Societal Movement hashtag (#ayacsm), connecting advocates in the adolescent and young adult cancer movement while helping deliver over 900 tweets per month from users all around the world. The “Giving Hope Fund” allows young adults currently battling cancer, as well as those who have been in remission for up to 5 years after their treatment, the opportunity to help pay for necessities they encounter in everyday life. This includes but is not limited to obligations,such as rent and mortgage payments, cell phone and credit card bills, clothing, work and educated related materials, department store and grocery gift cards, as well as laptops and educational materials. We would of course be remiss if we didn’t include the opportunity to make payments on all forms of medical bills, healthcare premiums, doctor visits and prescription co-pays. The “Giving Hope Fund” is posted on our website and through our social media accounts twice a year, normally once in the spring and once in the fall. from 18 – 40 with their financial hardships and needs. Hope4YAWC has been able to help pay for mortgage and rent payments, cell phone, daycare and medical bills, lawyer and estate planning fees, gas, grocery and department store gift cards, diapers, car seats and laptops for continuing education.